Easter is around the corner and for many people it’s time to think about their Easter menu. 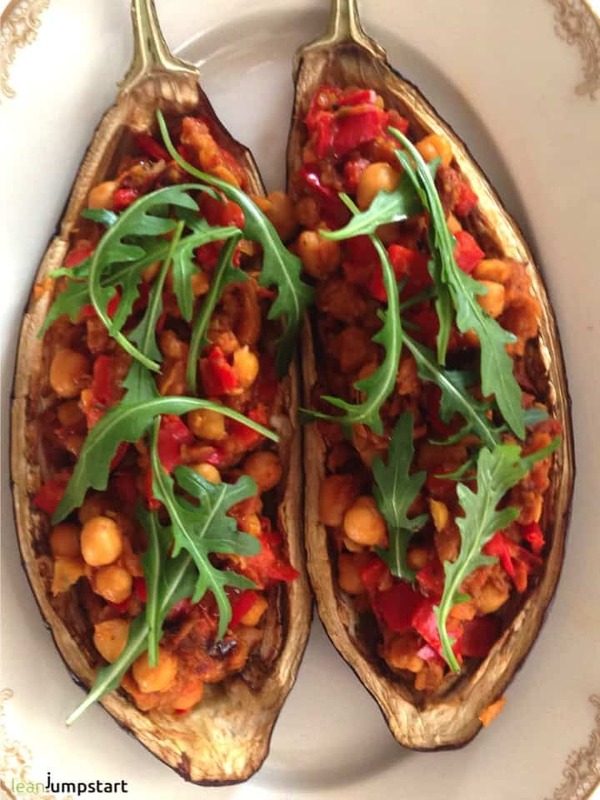 My simple oven baked eggplant recipe might come handy, if you are looking for a plant based meal. Maybe you just want to cut down your overall meat consumption or some of your loved ones turned vegan like in our case our daughter. Eggplants also known as aubergines are the ideal vegetables for stuffing – you can at least put something on them! Depending on their size you could use this dish either as appetizer in a menue or as a regular meal. There is even room for a yummy dessert after you’ve enjoyed an aubergine canoe. That’s why I think they would be perfect as light part of a festive menu e.g. on Easter. Whether baked, fried or grilled, eggplants are versatile, but shouldn’t be eaten raw! Aubergines contain the natural poison “solanine”, which is only destroyed during cooking. Filled and baked eggplant recipes are especially popular. There are different ways to prepare them and make them ready for stuffing. Some people cook them first in hot, salted water. We’ll do it different. Learn how to bake eggplants before filling in the following mouth-watering recipe. Preheat the oven to 250 °C/482°F. Wash aubergines and cut them in half. Then carve the flesh several times with a knife before you carefully scrape it out with a tablespoon so that the edge is about 5 mm wide. Chop the eggplant flesh finely. Mix 2 tbsp olive oil and some salt. Coat the aubergines with it. Arrange the purple vegetables on a baking tray covered with baking paper and bake on the top shelf for approx. 15 minutes until the aubergine skins are slightly colored. Larger types might need up to 30 minutes. Meanwhile heat 1 tbsp olive oil in a frying pan. Fry the onions, garlic, and chilli for about 2 minutes. Add the aubergine flesh, tomatoes, red pepper, oregano, thyme, curcuma and fry for about 5 minutes. Add the chickpeas, tomato paste and date syrup. Take the eggplants out of the oven, fill them with the mixture and spread some arugula on them. If you have large eggplants you could double the chickpeas. These nightshade vegetables are closely related to potatoes and tomatoes and come in a multitude of sizes, shapes and colors. Different varieties of eggplant may range from white to indigo. I’ve seen some purple-blush-white types and even yellow or orange eggplants species. The long, dark purple eggplant is probably the most common type of eggplants. So it’s not a surprise that the German, French and British English word for eggplant is aubergine. 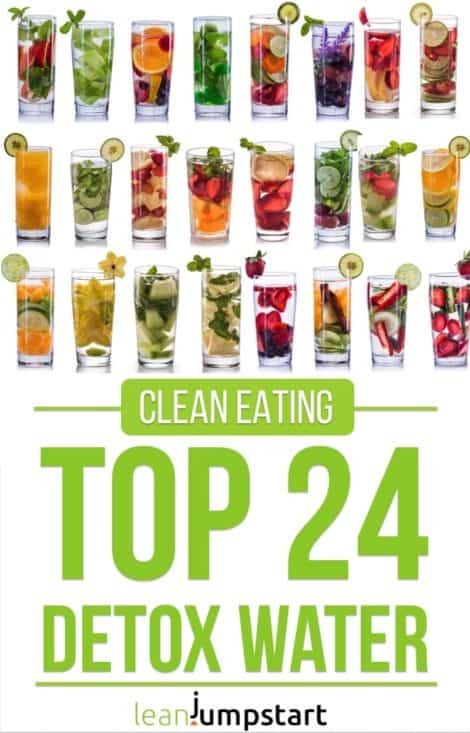 Over the last few months I’ve developed the habit to research some evidence based health benefits on certain foods and share it as blog post together with the clean eating recipe. I’m always delighted, when I learn how powerful especially plant based foods are regarding nutritional value, disease prevention or weight management. So, is eggplant good for you? In this context eggplant benefits don’t disappoint. Let’s start with the fiber in eggplants. With 3 grams of fiber per 100 grams of vegetable, aubergines can still be called high-fiber foods with a similar fiber concentration as savoy cabbage. Just to give you an idea, aubergines contain more fiber than carrots or broccoli. Check out the chart below. And if you want to refresh why fiber rich foods are good for you, I recommend to read my recent blog post, including all important high fiber foods lists. On top of that aubergines contain potassium as well as vitamins of the B group and vitamin C in the shell. This fiber vitamin combination is just the right mix for our cardiovascular system. 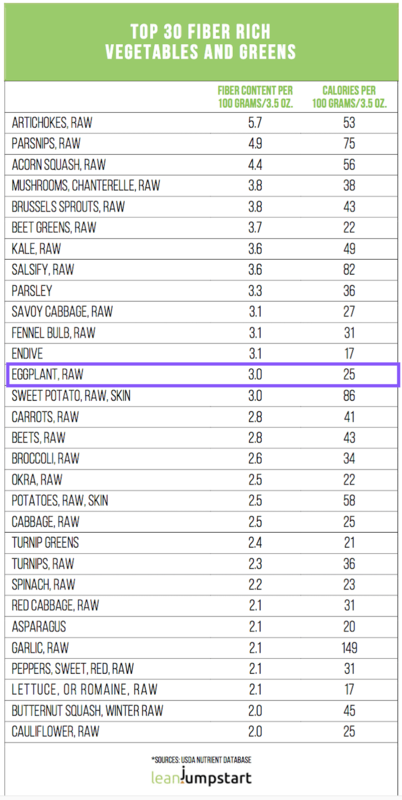 In addition, these vegetables can promote digestion and have anticancer properties. For a Mexican style replace the chickpeas with kidney beans and corn. You might want to season with cumin instead of turmeric. For a whole grain dish with an extra portion of fiber you can reduce the legumes and add some brown rice and/or whole grain bread crumbs to the filling. If you want to please a meat-lover, I recommend to add some ground meat to the veggies and let it cook 5-10 minutes before stuffing the aubergine. You can also get creative with the topping. Sprinkle some Feta cheese, Parmesan cheese or a vegan cheese over the stuffed vegetables and bake again for 5-10 minutes until the cheese is melted. Ratatouille: This French eggplant casserole recipe is another way to cook this nightshade vegetable. Check out my mouth-watering and eye-catching clean eating ratatouille recipe. So here you have it, my oven baked eggplant recipe. Before I let you go, I have one last tip for you. A ripe eggplant has a smooth skin with a matt gloss. The skin should be firm but not hard. When the vegetables are ripe they do not rebound to gentle pressure from your finger. If they do rebound however, then please don’t buy it, because aubergines don’t mature after harvesting.